Are there any positive end times signs that point to the soon return of Jesus? Nathan Jones: Clearly we live in the Church of Laodicea time period which is defined by apostasy. That is a negative spiritual sign, but there certainly must be positive spiritual signs to give us hope during this time? 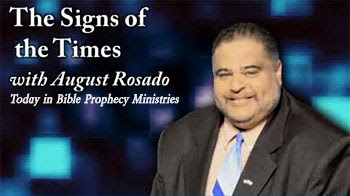 August Rosado: There are some positive spiritual signs. What we need to do is trust God and His holy Word and believe every jot and every tittle from Genesis 1:1 to Revelation 22:20, but especially Revelation 22:20, "Yes, I am coming soon." Dr. Reagan: I would say one of the most positive spiritual signs in this day and time is the preaching of the Gospel all over the world as it has never been done before, such as through the use of the Jesus film, through satellite television, through satellite radio, through missionaries going out all over the world, through the use of computers to translate the Bible rapidly into the many, many languages of the world, and so on. Boy, there are a lot of positive signs today! In fact, there are more people coming to Christ today than ever before in history, like 25,000 a day in China alone. August Rosado: That's a real blessing. I'm even hearing of Muslims coming to faith in Jesus. Nathan Jones: Especially in Africa, the imams are scared because the people are converting like crazy to Christianity over there. August Rosado: And the imams ask, "We don't know why our people are turning to the Lord Jesus Christ?" If they wonder why, they just have to read Matthew 24:14, "And this gospel of the kingdom shall be preached in all the world for a witness unto all nations; and then shall the end come." Dr. Reagan: I'm glad you quoted that verse because I wanted you to comment on it, because that is probably the most common letter or email I get. People will quote that verse and say, "Jesus cannot come back until that is fulfilled, so don't talk to me about the Rapture occurring at any moment." How would you respond? August Rosado: Matthew 24 deals only with the specifics of the Tribulation period. I know that many use Matthew 24:14 and apply it to the Church Age and say, "Until all the nations hear the Gospel, the Rapture of the Church cannot happen." But, that's referring to the Second Coming. That's not talking about the Rapture, because we can look at when God during the Tribulation period is going to raise up three groups or individuals to preach the Gospel. Firstly, there will be the 144,000 Jews from Revelation 7, and they're not the Church by the way. They will consist of exactly 12,000 Jews from each of the twelve tribes of Israel. I take that passage literally. There is nothing there to suggest that we should take it allegorically. Exactly 144,000 male Jewish Israelis will be preaching the Gospel during the Tribulation period. When they finish their testimony we secondly have the Two Witnesses of Revelation 11 who are going to be preaching the Gospel and multitudes are going to get saved. Thirdly, we have the Gospel angel in Revelation 14:6 preaching the everlasting Gospel. Dr. Reagan: In the very end, God by His grace and mercy before He pours out His final wrath sends an angel who proclaims the Gospel to every person on planet earth. That's when Matthew 24:14 is going to be fulfilled. In the next part of our interview with August Rosado, we'll ask him why he believes that Israel is the cornerstone sign of end time Bible prophecy. Thank you for this post. Recently, trying times have left me feeling frustrated and losing hope. When my thought turn to the end-times and the coming of our Lord, it keeps my mind set on the things above and not the going on here below. Thank you also for explaining Matthew 24:14. Thinking about the tribulation period is depressing but this article reminded me that during this period many souls will be saved. However, those poor Christians will suffer as the rest of us never will. Because of that, it's very difficult to put any positive spin on the end times. LOL! Yes, "positive" signs that God is going to unleash a temper tantrum of epic proportions. What silly little fantasies.